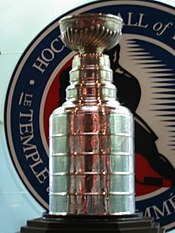 The 1983 Stanley Cup playoffs, the championship of the National Hockey League (NHL) began on April 5, after the conclusion of the 1982–83 NHL season. The playoffs concluded on May 17 with the champion New York Islanders defeating the Edmonton Oilers 4–0 to win the Final series four games to none and win the Stanley Cup for the fourth consecutive season. The 1983 Playoffs marked the first time that seven NHL teams based in Canada (Montreal, Toronto, Vancouver, Edmonton, Quebec, Winnipeg, and Calgary) all qualified for the playoffs in the same season. Since the 1967–68 expansion, all the Canadian teams have qualified for the playoffs on five other occasions – 1969 (Montreal and Toronto), 1975, 1976 and 1979 (Montreal, Toronto and Vancouver), and 1986 (the same seven as in 1983), the last time to date (as of 2018) that all active Canadian teams qualified. This is also the most recent time that the Toronto Maple Leafs and the Detroit Red Wings missed the playoffs in the same season. In the Wales Conference, the Patrick Division champion Philadelphia Flyers were upset by the New York Rangers in the first round. The defending champion Islanders had qualified second in the Patrick Division, and defeated the Washington Capitals in the first round, and defeated the Rangers to qualify for the Conference Final. In the Adams Division, the first-place Boston Bruins defeated the Quebec Nordiques and the Buffalo Sabres (who swept the Canadiens in their opening round series) to advance to the Conference Final. In the Conference Final, the Islanders defeated Boston in six games to qualify for their fourth consecutive Cup Finals appearance. In the Campbell Conference, the Smythe Division first seed Edmonton Oilers swept the Winnipeg Jets in the opening round, and defeated the Calgary Flames (who defeated the Vancouver Canucks three games to one in the opening round) in the Smythe Final. The Norris Champion Chicago Black Hawks defeated the St. Louis Blues three games to one and the Minnesota North Stars (who defeated the Toronto Maple Leafs three games to one in the opening round) in the Norris Final four games to one. Edmonton defeated the Norris Division champion Chicago Black Hawks in a four-game sweep in the Conference Final to advance to the Cup Final. Brad Park scored the game-winner in game seven on a slapshot off a rebound of his own shot just seconds earlier. The rising Edmonton Oilers qualified for their first final but more than met their match in the veteran Islanders. The Islanders won the series in a four-game sweep. Diamond, Dan, ed. (2000). Total Stanley Cup. Total Sports Canada. ISBN 1-892129-07-8.